The Los Angeles Chargers defense made five quarterback sacks, recovered two fumbles and intercepted a pass in a 21-0 victory over the Denver Broncos on Sunday in the franchise’s first shutout since 2014. Travis Benjamin returned a punt 65 yards for the game’s first score and caught the second of Philip Rivers’ two touchdown passes as the Chargers won their third consecutive game after losing their first four. Denver (3-3) outgained the Chargers, 251 yards to 241 and led in time of possession, 31:04-28:56. 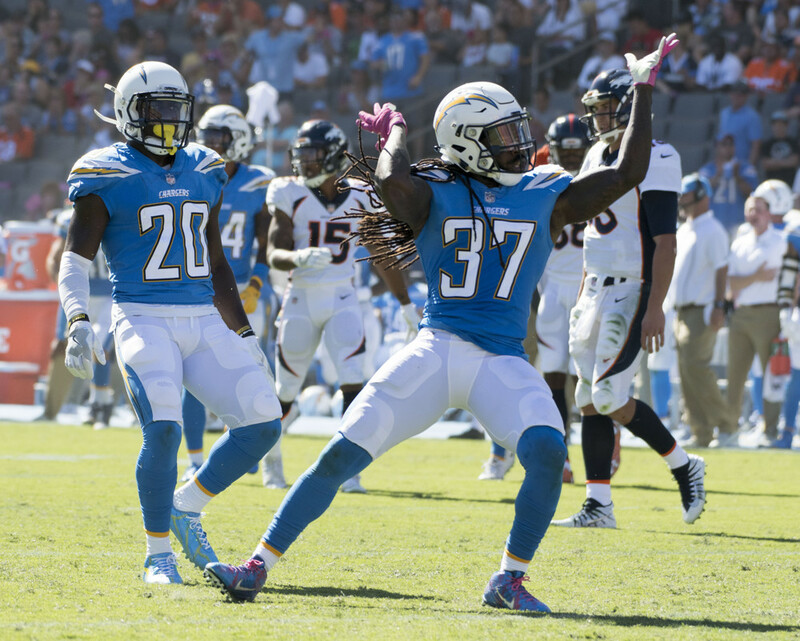 The Chargers led in first downs, 14-12 before a crowd at StubHub Center announced at 25,388. Each team punted eight times. Rivers completed 15 of 26 passes for 183 yards and was sacked three times. The victory was his 100th regular season win as a starting quarterback, the fifth active player to achieve that milestone. Trevor Siemian completed 25 of 35 passes for 207 yards and had one pass intercepted as the Broncos were shut out for the first time since Nov. 20, 2005 when they lost 27-0 to the New York Jets. Denver’s 394-game scoring streak was the second-longest in NFL history, behind the San Francisco 49ers 420-game streak from 1977 to 2004, according to ESPN Stats & Info. Benjamin opened the scoring seven minutes, 27 seconds into the first quarter on the Chargers first punt return touchdown since Michael Spurlock’s 63- yard return against the Jets on Dec. 23, 2012. The return touchdown was the fourth of Benjamin’s career. His previous three came when he played with the Cleveland Browns in 2012-15. After being forced to punt after three plays on each of their next two possessions, the Chargers drove 65 yards on nine plays, with Rivers completing a 1-yard touchdown pass to rookie running back Austin Ekeler 7:07 before halftime. Rivers completed all six of his passes on the drive for 48 yards, including a 19-yarder to Keenan Allen one play before the touchdown. Rivers also completed a 19-yard pass to tight end Hunter Henry two plays earlier. Following a scoreless third quarter, the Chargers had a 10-play, 92-yard drive in 6:53, culminating with Rivers 42-yard touchdown pass to Benjamin with 5:42 left. The Broncos crossed midfield once in the first half, driving to the Chargers 35-yard line when Siemian was sacked for a 5-yard loss by defensive end Chris McCain and fumbled, recovered by Chargers nose tackle Damion Square. Denver’s best scoring opportunity was in the fourth quarter when it trailed 21-0. Brandon Langley returned Nick Novak’s kickoff 61 yards to Chargers 43-yard line. Three consecutive passes from Siemian to tight end A.J. Derby moved the ball to the Chargers 11-yard line. Illegal formation and holding penalties pushed the Broncos back to their own 26. McCain sacked Siemian for an 8-yard loss on third-and-18 from the Chargers 19-yard line. Denver turned the ball over on downs when running back C.J. Anderson was tackled at the Chargers 10-yard line after catching a pass from Siemian. McCain had two sacks and forced two fumbles. Defensive end Joey Bosa also had two sacks in the Chargers first shutout since Oct. 5, 2014 when they defeated the Jets, 31-0. Combined with the Los Angeles Rams 33-0 victory over the Arizona Cardinals in London, this is the first time in the Super Bowl era two teams from the same city recorded shutouts in the same week, according to ESPN Stats & Info.